Now, more than ever, online retailers need a knight in shining armor in the call center. Online shoppers expect competitive prices, easy payment options, quick delivery and free returns, but the real differentiator is customer service. So much so, that a whopping 91 percent leave following a poor customer service experience and 89 percent will run straight into the arms of your competitors. These statistics should make every eCommerce business sit up and take notice, and yet, surprisingly, this opportunity is still being missed by the majority of online retailers with only 1 percent of customers reporting that they feel their expectations are always met. What can be done to turn this around? If customer service is the new battleground, then the call center agent is the knight in shining armor on the frontlines and the way to win this battle is to provide customers with an experience that is as seamless and effortless as possible. Findings from Forrester's consumer preference report on contact centers indicate that callers would like to have their problem solved quickly, desire personal interaction with an agent, and to speak with a skilled agent. Call centers that want to win the customer service battle are embracing Performance Support Systems (PSS) as their weapon of choice. Performance Support offers in-application guidance and desktop automation so that customer service agents are able to perform at their best to provide better customer service. Whether the agent is handling a customer service inquiry or processing a claim, the system provides exactly the right guidance at each step, in real-time. This allows the agent to focus on the conversation and provide the level of customer service that will keep your customers happy and coming back for more. The days when agents were handed a phone and a script are long gone. These days, training is an increasingly challenging responsibility that requires teaching agents to use numerous complicated systems, comply with various policies and procedures, and navigate through mountains of consumer information and data - all the while carrying on a friendly and engaging conversation. It's no wonder that call centers around the world experience exceptionally high employee turnover. Most training programs consist of a combination of classroom training and online learning. What these programs overlook is the fact that once employees leave the training environment, they have to put all their newly gained knowledge to work right away, often with an impatient and unsympathetic customer on the line. Take charge with performance support: Performance support offers just-in-time training, reducing the need for both classroom and online training. Using visual recognition technologies, the performance support application "sees" the screen just as the agent does, and constantly monitors the agent's activities within the application in real-time. The system guides the agent through the steps of the process and saves him/her the need to look for the information, learn how to do it and then return to the task to apply this knowledge. More advanced variations such as Leo can even automate the process so agents simply click a button to accomplish a task; a feature that is especially popular when dealing with infrequently asked requests that aren't covered in training. This not only improves customer service, but also dramatically reduces training time and costs. Forrester Research reported that 45 percent of U.S. shoppers will abandon an online transaction if their questions or concerns are not addressed quickly and almost every call center manager will tell you that no single KPI has a bigger impact on customer satisfaction than First Call Resolution (FCR). In a study of more than 150 call centers by the Service Quality Measurement Group it was found that for every 1% of improvement in the FCR there is a corresponding 1% improvement in customer satisfaction. The SQM report also found that call centers that achieved “world class” customer satisfaction ratings had a FCR average of 86%, while centers that were not among the elite in customer satisfaction had a FCR average of only 67%. Take charge with performance support: Rekeying data, updating fields, navigating complex applications and retrieving customer specific information - are just some of the many tasks today’s call center agents perform while contending with often-frustrated customers. The key to improved FCR is providing your agents with the relevant information at the right time in a manner that allows them to focus on the customer. Performance support does just that. It makes knowledge and information extremely accessible, by displaying overlaid tooltips on top of the application itself, at the moment of need, so that agents can focus on creating lasting impressions that drive customer engagement and repeat business. 3. Ask "how likely are you to recommend us? Getting direct feedback from your customers is the best way to get a clear picture of where you stand and what improvements are needed for providing better customer service. While there are various methods to go about measuring customer satisfaction, from old school feedback surveys to complex data capturing, the Net Performer Score (NPS) has been proven as a simple and very effective way for evaluating customer satisfaction and loyalty. It's calculated from the answers to this simple question: "How likely are you to recommend us?" The number of people who would, minus the ones who wouldn't, gives you the Net Promoter Score. Take charge with performance support: Customers want to be appreciated and they can feel when they have your full attention and when they don't. The more engaged your customer service rep is with a customer, the more that you are showing them that you truly appreciate and value their business as well as understand their concerns. Performance support uses in context, application guidance that adapts to the actual conversation. This allows customer service agents to offer the best answer/solution quickly and with significantly less errors. Meanwhile, the desktop automation part of performance support enables a seamless business process so your agent can concentrate on the customer and the issue at hand. This goes a long way to alleviate customer frustration and improve the customer experience. 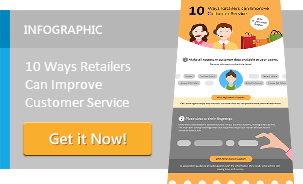 For 10 more ways to improve your eCommerce customer experience download a copy of our free, printable infographic infographic!